For the last of my gift guides this year, I wanted to collate some gorgeous stocking filler ideas with some favourite pocket sized treats that I’ve picked up over the last few months. There’s a mix of beauty, lifestyle and jewellery so there should be lots of inspiration to draw from! Starting off with some drugstore beauty, the Zoella Gelat-eau Body Mist was one of the standout products from Zoe’s summer launch this year. It’s a really affordable body mist that smells very fresh, making it the perfect little fragrance to drop into a stocking. The packaging is gorgeous too which is always a bonus! Another great affordable skincare product is the Mario Badescu Rose Facial Spray. It’s such a great pick-me-up in the mornings and evenings, and it adds that little bit of ‘extra’ into anyone’s skincare regime. Definitely a princess product, but if it’s in your stocking, totally justified. However, something more integral to my skincare routine is the Pixi Glow Tonic* which I use every single day. It’s great for exfoliating and brightening the skin as a toner and it’s available in the most adorable mini size which is perfect for a stocking! I mentioned that there would be plenty of Pixi in my gift guides this year and I wasn’t joking – the Pixi Lip Polish* would make another gorgeous idea for a stocking-sized gift. This is perfect as a night time nourishing lip oil with a little exfoliating pad that ensures lips are soft and smooth in the morning. It’s also a great pre-lipstick prep product for a really voluminous pout. Pretty hand creams make a gift feel really luxe, even if just to fill a stocking. I’m a huge fan of the Crabtree & Evelyn Hand Therapy Hydrating Cream* which smells incredible and so unique. They have lots of different fragrances to choose from and each cream has different skin benefits too. 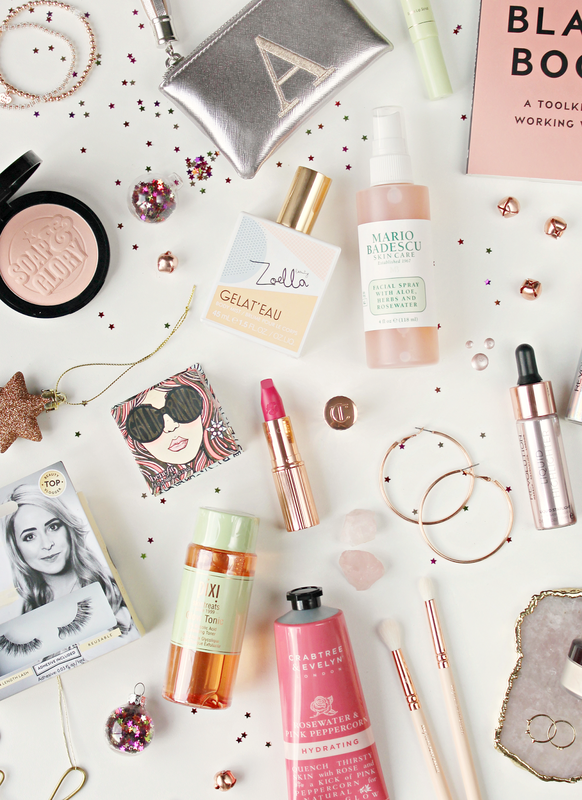 Onto makeup picks… the Benefit Galifornia Blush is a recent purchase of mine – I just couldn’t resist the colourful packaging! And no regrets, the blush is totally gorgeous and wearable by so many skin tones. It’s a beautiful peachy coral with a hint of shimmer, and as I mentioned a few moments ago, the packaging is beaut. Speaking of stunning packaging, you can’t go wrong with a bit of Tilbs as a stocking filler – and the Charlotte Tilbury Hot Lips Lipstick in Electric Poppy is my favourite festive shade of the year. It’s a bright pink-red that looks so striking when used as a pop of colour with simpler makeup. I couldn’t have a stocking gift guide without a couple of highlight options so here are my two picks for this year: the Soap & Glory Glow All Out Highlighter is a firm favourite of mine – in fact, I recently purchased my second pan. It’s super glowy, with pink undertones and it’s very affordable too. Even more affordable are the Makeup Revolution Liquid Glow Drops. These types of liquid highlighters have been huge this year and they’ve filtered into the drugstore with some gorgeous shades to chose from. The bottles look really special too, so they’ll definitely be appreciated by someone who loves a good glow! False lashes are a really handy gift idea for stockings as they come in so useful over the festive parties and New Year celebrations. My all time favourite lashes are the Fleur De Force Petit Fleur Lashes which I actually wore on my wedding. I never like anything too dramatic and these are the perfect balance for me – a little bit of extra lash without it being too obvious. A few non-beauty ideas include some of the monogrammed goodness in Matalan at the moment – this purse is so adorable and extremely festive, not to mention super affordable as a stocking filler. I’ve featured my Anthropologie agate coasters a lot over the past few months so I thought I should definitely mention them as a gift idea this year. They are each incredibly unique and super special so I highly recommend them for someone who loves hot drinks! Pretty costume jewellery is a lovely way to fill up a stocking as well, and some of my favourite places to find them are Accessorize and Urban Outfitters. If you’re looking for a more special piece to gift, Annie Haak offers so many gorgeous bracelets* that are packaged beautifully and would make the perfect gift. A cute little book is a great stocking stuffer, and my favourite is definitely the Little Black Book by Otegha Uwagba. It’s the perfect little toolkit for any girlboss and would make a wonderfully motivational read with the new year just around the corner. 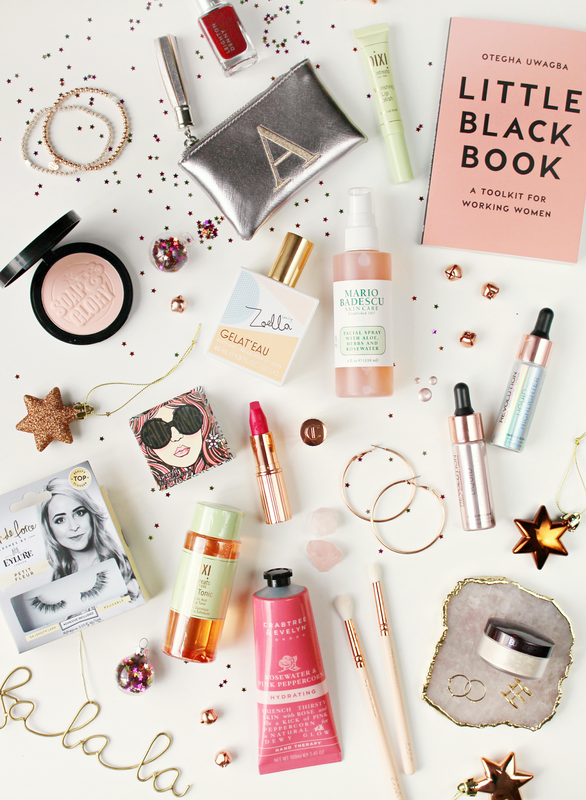 What are your favourite stocking filler ideas? Previous Post Gift Guide: Home & Lifestyle. Next Post My 1K Giveaway!